Americans for Prosperity-New Mexico (AFP-NM) remains enthusiastic after McKinley County Commissioner Bill Lee brought forward an ordinance to implement right-to-work in the county. If you guessed New Mexico, you’re wrong. But it certainly could be one day, if the state applies that last bullet point. New Mexico is a non-right-to-work state. Americans for Prosperity-New Mexico (AFP-NM) is being lauded as a key driver in the efforts to turn New Mexico into the next right-to-work success story. 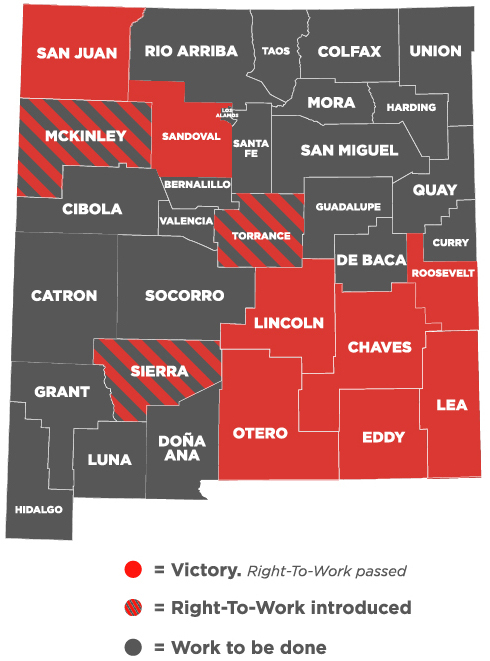 Americans for Prosperity-New Mexico (AFP-NM), the state’s leading advocates for common sense labor reforms is applauding the vote today by Otero County Commissioners that make the county the second in New Mexico to enact a right-to-work ordinance. Don’t believe the false narrative about right to work legislation. Defenders of the union status quo will tell you that forced unionization is necessary to protect New Mexican workers, and that every member of the union should pay dues.